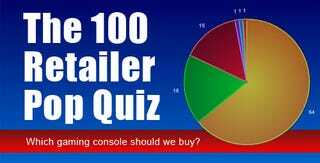 The 100 Retailer Pop Quiz - What Gaming Console Should We Buy? Click to view Being a video game retail outlet employee is a very important job in the gaming industry. While the more net savvy gamer might occasionally get a chuckle out of a bit of misinformation overheard at their local store, every day hopeless, helpless parents look to them like modern-day gurus, only instead of joining caravans to climb mountains they're climbing into Caravans and Mountaineers, the dreams of their little game-hopeful children riding on the wisdom or lack thereof delivered from some mildly annoyed customer service representative's mouth. For them, these fellows are the end all, be all when it comes to gaming. We're all plugged in, but what kind of information would we find if - just for a moment - we pretend we're as disconnected as some parents today? I decided to see what sort of guidance the lost parents, aunts, and uncles get from video game retail by presenting one hundred stores with one question. "What video game system should I buy for a 15 year-old boy? "Store Breakdown: The 100 telephone calls were divided between three retail chains - Game Crazy, up and coming franchise chain Play N Trade, and retail juggernaut GameStop. I called 25 stores each for the first two, with GameStop taking up the remaining 50 as a nod to the enormous size and reach of the company. The Process: The process was relatively straightforward. Forgetting everything I know about video game consoles, I was to call 100 video game retail outlets, posing as a man who has a nephew who is going to turn 15 (I do, eventually), who would like to buy him a game system for his birthday. Having spent several years in the video game retail business, I figured I could come off as ignorant rather well. Why 15? I figured it was a number that represented a good middle point in gaming life. Old enough to have a unique identity while not quite old enough that the person on the other end of the phone doesn't start wondering why I didn't just send him into the store with money like all the other parents do. I did set a few ground rules. No leading the employees. I could give no other information about my "nephew" other than the fact that he is to be 15-years-old and has no gaming systems. I have no knowledge of his likes or dislikes, his activity schedule, etc. No naming a console until the representative on the phone does. Which game system should I get him? Saying the name of a system before getting an answer could spoil the results. With those simple guidelines in place, I proceeded to lose all the recent calls I had stored in my cell phone. The calls were place over the course of a two-week period that ended on Saturday the 13th of September, 2008. Retail locations were picked in a random fashion from all across the U.S., using store locators with random zip codes and sometimes by simply closing my eyes and picking one. Random comes in all flavors. The results come in convenient pie graph form. You might notice a slight balance issue here. Let's take a closer look at the numbers and how they came about. Keep in mind here that the pros, cons, and quotes listed after each console come from answers that were both for and against them, and do not represent my opinion of any of the consoles. Xbox 360 - 64%: The Xbox 360 hands-down came out on top of the console heap as far as retail employees were concerned, beating out the Wii (for the most part) and PlayStation 3 by a very wide margin. Apparently 15-year-old boys and the Xbox 360 were made for each other. Out of all the responses I received to my questions, those who gave the Xbox 360 as an answer generally didn't dance around the decision. Pros: Largest game library with widest selection Best system for online games More user friendly Cons: Hardware reliability Not as powerful as the PS3 Game Recommendations: Most retailers couldn't or wouldn't choose just one game, instead listing off the different genres - racing, shooting, sports, etc. There were a few standouts, however. Four stores recommended Soul Calibur IV right off the bat, and several mentioned Halo 3 and Call of Duty 4: Modern Warfare as stand out titles. One guy even suggested I pick up Saint's Row...for my fifteen-year-old hypothetical nephew. Also, while not identifying it as one of the system's best games, Star Wars: The Force Unleashed was mentioned many, many times. It's available for pre-order, you know. *checks watch* Oops, too late. Quotes: "The 360 is the sweet spot for gaming consoles." "It's the more user-friendly system." Xbox 360 or Wii - 18%: A surprising number of employees across all three chains wouldn't answer the question without at least asking one question - is your nephew and indoor child, or an active outdoor child? A more active child would love the Wii, while one prone to sitting still would prefer the Xbox 360. Given that my criteria for asking the question didn't allow me to offer specifics about my theoretical nephew, I had to record the double answer. I guess that whole Wii60 idea people were kicking about prior to the Wii launch isn't as far fetched as it first sounded. Quotes: "If he never had a video game system before he might like the Wii." Nintendo Wii - 1%: This low score for Nintendo's console is a direct reflection of the age I picked. We all know this. If I had said 10-year-old then the graph would look very different, but according to many a store he's right at that age where he'll be growing out of it - and about 50 years too early for liking it a second time. Pros: Promotes physical activity Whole family can play Cons: Many of the games aren't good Too "cartoony" Better graphics on other systems Recommended Games: From the one store that flat-out suggested I buy fake-boy a Wii, Super Smash Bros. Brawl. Quotes: "The Wii is for younger kids - and old people." Yes, he really did say this. PS3 / Wii - 1%: This recommendation was pretty much the same thing as the Xbox 360 / Wii combo answer. For a more active child get the Wii, for a more sedentary one get the PS3. PS3 / Xbox 360 - 1%: If it's going in the family room, get a PS3 for Blu-ray. If it's going into a bedroom, get an Xbox 360. Apparently teens don't need private Blu-ray players. For those of you interested, here's the breakdown by store. Kudos to GameStop for the more creative suggestions. The Conclusion: So what knowledge can be drawn from these results? One could say that game stores in general are strongly biased towards the Xbox 360, but there are more factors weighing in here than simple preference. It's the system they've sold the longest, and it does indeed have the largest library of titles at the moment, so the majority of their day is spent staring at a giant wall of 360 games next to relatively smaller PlayStation 3 and Wii sections. While the poor showing of the Wii is mainly an indicator of the perceived age range of the product, it certainly says something about Nintendo's failure to capture the imagination of the more mainstream gamer in its quest to capture a more atypical market. Luckily for Nintendo, however, more parents are seeing the Wii on television or hearing about it from friends and colleagues that by the time they hit the store to buy one they don't have to ask which console they need. Which leaves us with the PlayStation 3. Even the most ravenous Sony fan has to admit the the library of games is small, but Sony generally doesn't stay small for long. I've a feeling that if we were to revisit this experiment in a year we'd see some very different results. I surely hope so, as right now gap is a bit too wide for my liking. The only question that remains is are the parents that seek the help of these 'gaming gurus' being led astray? While the presence of substantial multi-console suggestions and probing questions instead of snap judgments is heartening, the answer to that question is ultimately up to you.